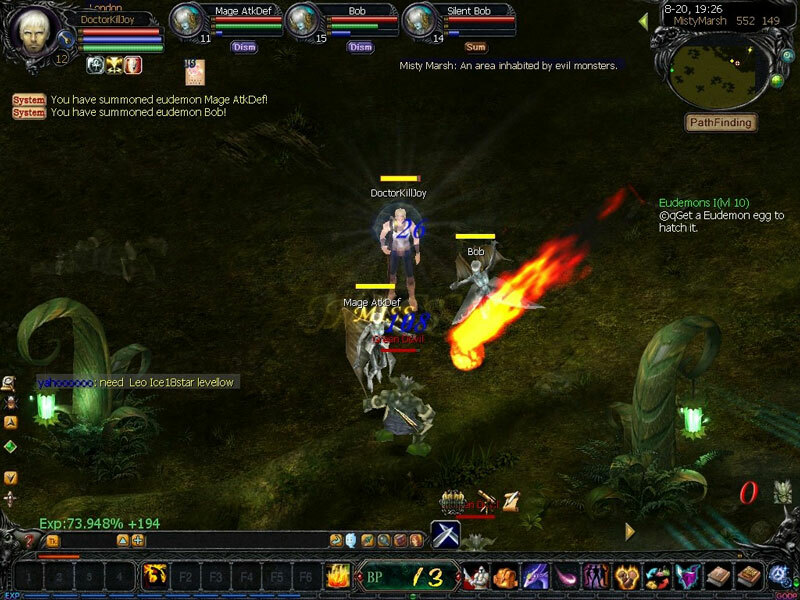 Eudemons Online is a Free to Play, Fantasy Role-Playing MMO Game in which you must command your heroes and eudemons to adventure on the vast land of Atlantis. "Storyline of Eudemons - In the center of the continent, there lies a mysterious castle which was sealed by a very big and heavy lock. It is said that the one who can unlock the door will have the ability to overwhelm the world. Years passed, none could get in until one day, the very day this story commences. Eudemons Online changes the banal rules of traditional online games and redefines the number of enemies. Nobody will fight alone in Eudemons Online, for the eudemons will be your strongest support! Eudemon system is unique in Eudemons Online. Every beginner will get two eudemons after they first log in. With the development of game, you can summon three eudemons at last! The appearance of eudemons not only changed the number contrast between monsters and you, but also overturns the strength contrast. An eudemon is not only your fellow but also the strongest living weapon. Converging with different type of eudemons, you will combine with different attributes. Your attack and defence will both be improved greatly. Everyone can summon and compose with three eudemons at the same time at most. There are a wide range of eudemons in "Eudemon Online", every eudemon has his unique attributes. How to arrange the eudemons is a question that you should consider carefully.